The rickshaw pullers have a really tough time starting the rickshaw when its still, or pulling it up-hill ( even a 5-10 degree elevation). Its a solved problem, bi-cycles have gears for the same reason. If you have gears, you switch to gear 1 or gear 2 and pulling it to gain some momentum becomes a peice of cake. The pullers who are not that physically strong can start pulling rickshaws as well as who are strong can pull for a longer duration and will not get tired quickly. This way they would potentially can stay healthier & can potentially make more money. Also, the cost involved in getting the gears installed would not be more than 10% -15% of the original cost. 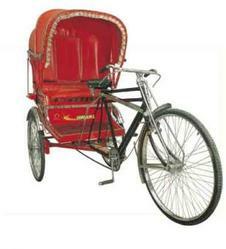 Dear Rickshaw making companies – are you listening ? Dear Indian Government – are you listening ? Hey Pankaj: You have an opportunity to do a social experiment here. Talk to one of those Rickshaw wala and get a gear installed by local cycle guy. You may learn a lot from this experience. Thanks Rahul ! Thats a great idea, I ll try that experiment .